Pressure is a CPU stress tester. It can either be run in a console window or installed as a Windows service. A separate console program is used to communicate with and control the service. Installutil pops up a gui that asks for a computername\username combination and password in order to install the service. start/stop via "net start pressure" or "net stop pressure", or via the services GUI. activate console mode via the "-console" command line flag. For instance: "PressureService.exe -console"
Behaves the same as service mode, except its not a service. End with 'q'. When started, it will ramp up all cores to 100%. Waiting for connection...Connected to Pressure Service. Batch mode wants "-x" as its first argument, then core:percent pairs. For instance: "PressureConsole.exe -x 0:50 1:75"
There is also an easter egg command. "c 100000000" for instance will instruct the service to loop 100000000 times before sleeping. This can be used to tweak the service to a particular processor speed. We allow the settings of values 1-100%. 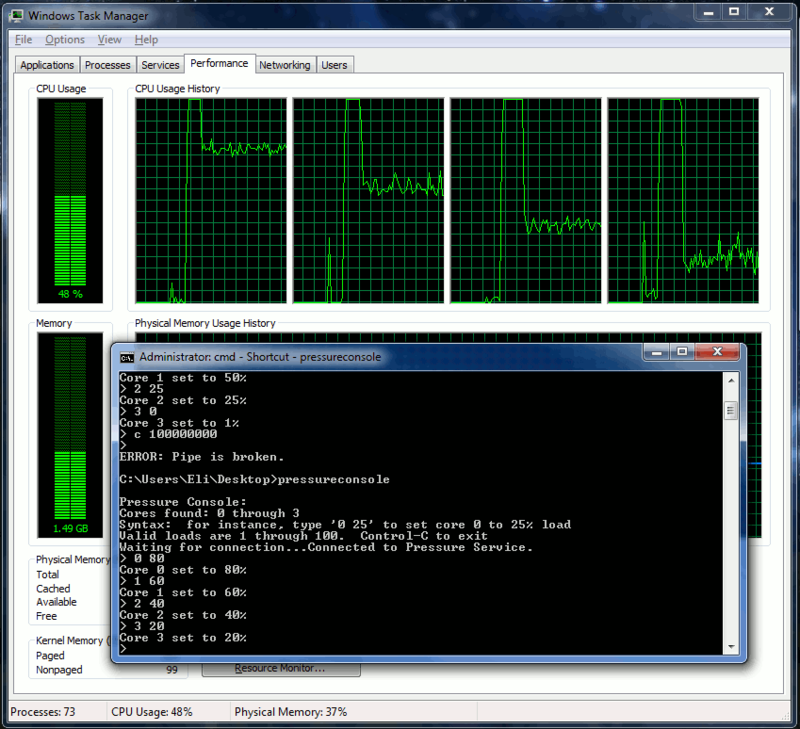 The actual CPU usage is close, but not as precise as single percentage points would imply. Other things happening on the system will also add to the CPU usage - this program is only attempting for instance to do 25% cpu by itself. It doesn't notice other program's usage. Low CPU values are accomplished via sleep()ing the threads. Setting a low value, (say 1%) then immediately setting a high value won't work - the thread is still sleepy and will remain so until it feels it has met its original 1% obligation and wakes back up. Only tested on a single processor with 4 cores. Theoretically has a hardcoded limit of 1024 cores. Untested as to whether 1024 works, but 1025 will definitely fail.